With summer coming up, I love having cool drinks to keep me from getting too hot. With the addition of Trop50 raspberry acai juice, I created this drink for "Girls Night In". -Good food- this is the number one must have besides girlfriends or family. Favorites include 7 layer Mexican dip, takeout food, veggie tray, fruit, ice cream, etc. -Tasty drink- This used to include wine or champagne but now that I am pregnant, I have become the queen of mocktails. I enjoy club soda, cranberry juice, fresh oranges and lime (my husband created that one for me!). 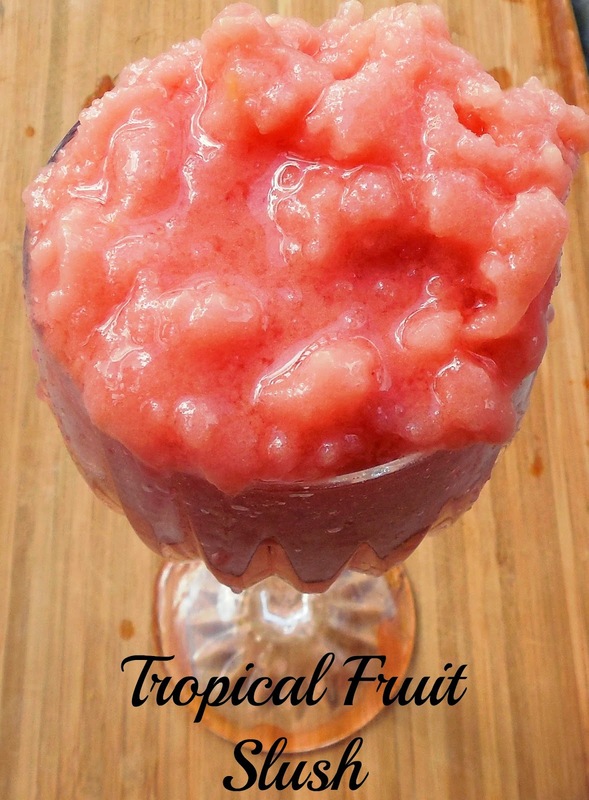 Another favorite is this tropical fruit slush that I created. -A good movie- Often times, I have a Girl's Night with my mom and sister when the guys are out of town or at an event. We love watching funny, romantic or thriller movies (leave the action out!). -Dogs- If you know me or have been reading my blog for some time, you know that I love my dogs so much. When I have Girl's Night, we always have my parent's dogs and my dogs there. -Good company- Of course, you need good company to enjoy Girl's Night along with great conversation. Besides this, anything goes. These are the main essentials though. For Girl's Night In, try making this fruity beverage. Directions: Blend all ingredients together until there are no chunks. Serve immediately. For more recipes for Girl's Night In, check out this awesome board on Foodie's Pinterest page. Here are some more ideas for Girl's Night In. Starting May 1, there is a Pinterest Sweepstakes starting for Girl's Night In where you can pin a recipe from the Girl's Night In Board or pin your own.